Only modality to permanently treat red, white or blonde hairs. Safe and effective modality for darker skin color. 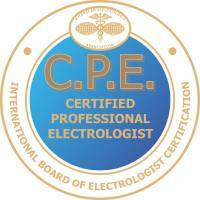 Electrology appointments are available with June at two locations. button at the top of this page. TIRED OF WAXING AND TWEEZING AND INGROWN HAIRS? NOT COMPLETELY THRILLED WITH YOUR LASER RESULTS? Permanent Hair Removal has been my passion decades. As a seasoned electrologist, I will help you to achieve permanent results as quickly as possible by providing effective, quality and comfortable treatments. Utilizing cutting edge technology which is the best in the industry, we bring amazing results. Treatments provide much less sensation and permanent results are achieved about 35-40% faster than previously. Fewer treatments are needed to get the desired results. All treatments are prorated. If we schedule more time than you need, you only pay for the amount of time utilized. Our treatments range from 5 minutes to 60 minutes. Rest assured, you will be receiving the most effective and quality treatments available to the industry. ~ It is the universal method of hair removal that does not discriminate. 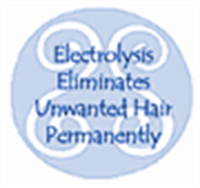 ~ It is the only method of permanent hair removal available for red, blond or white hair. ~ It is the modality of choice for dark skinned individuals. Only Electrology can permanently and safely shape eyebrows. 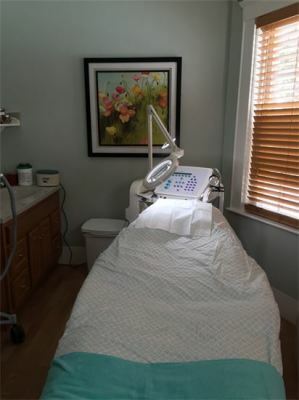 "Electrolysis.... a commitment you make to yourself for yourself"
nape neck, widows peak, legs, under-arms, breasts, abdomen, back, and bikini line. It is the only method available to safely and permanently shape the eyebrows. It is effective on light or dark colored hair, as well as any skin tone. It is the answer for women troubled with hirsuitism and hormonal issues like PCOS, Adrenals, etc. Our latest magnification is enhanced with the use of surgical loupes and lighted magnification providing supreme visability and successful treatment of even the finest blond hairs. Permanent hair removal results depend on the skill, accuracy, and judgment of the electrologist. ~ In most instances, you should not feel the hair being pulled out during the treatment. The hair slides out easily if properly treated. With flash shortwave, just one or two taps and the hair should release. ~ Following a consistent series of treatments, you should see a change in the texture of coarse hair within 3 to 4 months and also a good reduction in the amount of hairs. (You should start to require less treatment time to complete the area being treated). ~ By six months, the frequency and length of time per treatment should be reduced. 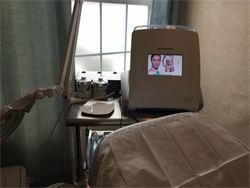 ~ Within a year, your appointments should be spaced much farther apart, possibly of a shorter duration and you will be coming in for clean ups. ~ A sterile probe is gently inserted into the follicle, a natural opening along side of the hair. 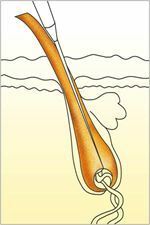 Because this is a natural opening of the skin, the insertion of the probe into the follicle is not felt by the client. ~ A measured amount of energy is then released via the probe into the follicle to destroy the source of growth. With flash shortwave, just one or two taps and the hair should release with no resistance. If it does not release in one or two taps, the settings will be adjusted to assure adequate energy is utilized. ~ What the client may actually feel is the application of the current. Everyone feels it differently. There are many options available to assure that your treatment is comfortable. These will be discussed during your consultation. ~ The hair should then gently slide out of the follicle as the electrologists grasps it with her tweezers. 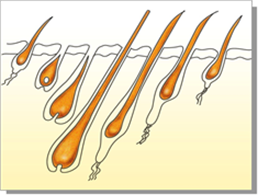 A single hair grows for 10 to 12 weeks, falls out and then starts the cycle all over again. Because of the nature of the hair growth cycles, it can take up to 3 months before all the hairs come to the surface of the skin to be treated. Following your first treatment, there is still a collection of hair below the skin that has not been treated. This is referred to as the undergrowth. The best time to come in for your next treatment is when the hairs are first appearing at the surface of the skin. This is when the hair is in the active growing stage and we have complete access to the dermal papilla where the energy is most needed. Permanent results are best achieved by faithful participation in a planned program that has been tailored to your needs. This will all be discussed during your complementary consultation. Our office adheres to the recommended national standards for sterilization procedures in electrology offices established by the American Electrology Association in conjunction with The Centers for Disease Control and Prevention (CDC). Stop tweezing and waxing the area for one week before treatment. You may trim hair to be treated with cuticle scissors. long enough grasp with our tweezers. It will make the treatment more comfortable. It is safe to treat tanned skin but no sun burns allowed. and the treatment more comfortable. in a burn or blister. Be sure to exfoliate well.